Almonds explained clearly and simply. Cooking uses and their history. 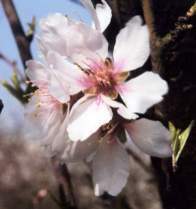 Almonds are oval shaped fruit from the tree Prunus dulcis (sweet or bitter almond), a close relative to the apricot and peach tree. The tree originates from the Middle East and thrives only in warm climates. The major producers of almonds are Italy and Spain for the European markets and California for the American market. 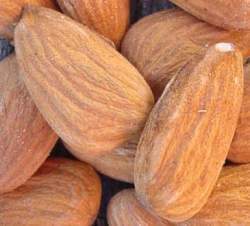 Sweet and bitter almonds are used for cooking but bitter almonds are poisonous so must be used carefully and in the correct quantities. Almonds have been used in cooking for thousands of years and they are mentioned in the Bible. In ancient Greece, the nuts were crushed and mixed with honey to make marzipan. Sweet almonds are most commonly used in cooking and they come from a pink flowering tree (see picture on the right). 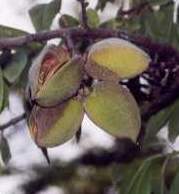 Bitter almonds come from a very similar tree which is white flowering. These almonds contain prussic acid which will kill a human even if taken in small quantities. Cooking crushed bitter almonds removes much of the dangerous acid (although some will remain). The uncooked bitter almond is by far the most dangerous form. Sweet almonds can be eaten raw, roasted or grilled with salt. They are commonly used in savoury dishes, cakes and deserts where they are normally ground or crushed. Almonds are best stored in an airtight container and keep best in the fridge. To roast or toast almonds, pre-heat the oven to 180°C / 350°F / Gas Mark 4. Place the almonds (whole) in a single layer on a baking tray and roast for around 8 minutes. Almonds burn easily so keep an eye on them whilst they are cooking. To blanch almonds, place them in a bowl and pour on boiling water. Leave them in the hot water for 4 minutes. Take each almond out individually, squeeze it between your fingers and the skin will slide off.